Now, when the full image of the difference between planets' cycles is clear, we can see how those cycles cooperate and interrelate with each other. 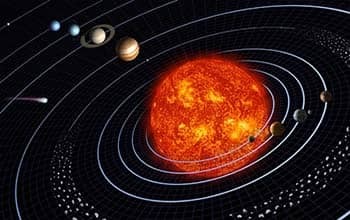 Imagine just that the Moon and the Sun and other planets are moving through the signs in each cycle. While moving they are creating certain aspects to one another and in the chart. As the Moon is the fastest one and moves with the speed 13 degrees a day, it will cross each point in the chart every 27 ½ days. Saturn, for example, will have very important aspect to the chart every 7 years, and it will result in tangible changes for our relationships. The cycle of each planet directly corresponds to the length of its orbit. Another important point to note when speaking about aspects and celestial cycles is the conception of applying and separating aspects. Let's take two interacting planets, one of them is faster and moves towards the slower planet, the aspect will be an applying one. The aspect is exact by degree. When the faster planet "runs" away from being in aspect to the second planet, it is called a separating aspect. So the separating aspect degree is changing and separates from the slower planet. So, for example Saturn is at 15 degrees Pisces and the Sun is at 10 degrees Cancer, the Sun is in an applying trine to Saturn. So for instance at the same time, the Moon is at 12 degrees Libra, it is in a separating to the Sun. It may appear complicated at first, it is a nice reminder that celestial bodies are in continuous action at absolutely different speeds and in changing interrelations with one another. Also, it is needed to go through a notion of orb. The orb of the planet or aspect is actually an area of operation within which an aspect impacts our lives. Stated differently, a conjunction with the Sun in a natal chart can have an orb of 8°, therefore the Sun to Pluto conjunction, for instance, would be active if Pluto is at 13° Scorpio and the Sun is somewhere from 5° to 21° to Scorpio. It can be said that the Sun is in applying aspect to Pluto from 5° to 13° (where it creates an accurate conjunction), and then in separation aspect from 13° to 21°. For more information regarding this topic and deeper knowledge of the processes of applying or separating and conception of orb, please, check books on Astrology. This information is only descriptive and introductory. Now, it is time to look through all the astrological articles that you've seen before and recharge with the information. Check the articles on the planets, zodiac signs, aspects and try to draw their symbols until you remember them without efforts. Don't forget that Astrology is a precious repository of knowledge that can be very useful for different areas of life, for making right decisions and choosing prosperous directions. Try to perceive the beauty and depth of symbols of this science. Draw them, use your imagination and give each a color. One night, you'll look in the sky and will be able to read it and feel yourself the part of the enormous space. Mars has quite long cycle – approximately 22 months. Jupiter's cycle is 12 years. Saturn is related to the flow of time. Pluto's orbit is unstable, moving differently in each sign and generally taking 248 years to complete the full zodiac circle.